Human rights activist and Nobel Peace Prize recipient Kailash Satyarthi has been at the forefront of the global movement to end child slavery and exploitation since 1980 when he gave up a career as an electrical engineer to begin his crusade. The grassroots activist, and the first grassroot movement he founded, Bachpan Bachao Andolan (Save Childhood Movement), have liberated more than 87,000 children from exploitation and he’s been awarded the world’s most famous prize, but Satyarthi relentlessly seeks to do more. Satyarthi was born in a small town in the Indian state of Madhya Pradesh in a middle class family. His father was a police constable and his mother an uneducated, highly idealistic housewife. According to him, his mother’s idealism and helpful nature had a big impact on him. After completing an electrical engineering degree, he briefly worked as a teacher until 1980, when he founded Bachpan Bachao Andolan. The first ‘D’ is to dream: dream big — not for yourself, but for the country and for the world. The second ‘D’ is to discover: discover your full potential and the opportunities that surround you; and the third ‘D’ is to do. ‘Do’ means to act on your dreams and make best use of the opportunities you have discovered. BBA is India’s largest movement and works to create a child-friendly world where all children are free from exploitation and abuse by identifying, releasing, rehabilitating and educating children in servitude through prevention, direct intervention, coalition building, mobilization and legal action. The organization has been instrumental in rescuing over 87,000 victims from situations of modern day slavery and trafficking for forced labour. Satyarthi founded GoodWeave International, formerly Rugmark, in 1994. Dedicated to ending illegal child labour in the rug making industry, the non-profit organization provides a certification program that allows companies that pass inspection to attach a logo certifying that their product is made without child labour. In 1998, Satyarthi started and led the Global March Against Child Labour, one of the largest social movements ever on behalf of exploited children. Thousands of people put forth their message in the 80,000 km-long march which crossed 103 countries and brought immense awareness. Over seven million people, including world leaders, expressed their support. The march culminated in Geneva on June 01, 1998, while the International Labour Conference was in session, and the voice of the marchers was heard and reflected in the draft of the ILO Convention 182 on the Worst Forms of Child Labour. The convention was formally acclaimed in 1999 and went on to become the fastest ratified convention in the history of the ILO. Satyarthi formed the Global Campaign for Education, and was made president of the organization, in 1999. An international coalition of non-governmental organizations, GCE works to promote children’s and adult education through research and advocacy. It was formed as a partnership between NGOs already separately active in the area, including ActionAid, Oxfam, Education International, Global March Against Child Labour and national organizations in Bangladesh, Brazil and South Africa. In 2004, Satyarthi established the Kailash Satyarthi Children’s Foundation to help achieve a child-friendly world through spreading awareness, policy advocacy and capacity building. The KSCF launched The Bharat Yatra in 2017 to spread awareness about child trafficking and sexual abuse. The campaign marched through seven routes, covering 22 Indian states and Union territories and over 12,000 km. Five thousand civil society organizations, more than 60 faith leaders, 500 political leaders, 600 local, state and national bodies of government, 300 members of the judiciary, and 25,000 educational institutions across India got involved, and more than 1,200,000 marchers participated over 35 days. Satyarthi has been the subject of numerous documentaries, television series, talk shows, and advocacy and awareness films, and in 2017, India Times listed him as one of the 11 Human Rights Activists Whose Life Mission Is To Provide Others With A Dignified Life. This past September, YouTube announced its acquisition of the award-winning documentary The Price of Free (formerly titled Kailash), a suspenseful yet intimate look at Satyarthi’s groundbreaking struggle to free every child possible, from rising director Derek Doneen and producer Davis Guggenheim. Also the recipient of numerous national and international awards and honours, most notably, in 2014, he was awarded the Nobel Peace Prize jointly with Malala Yousafzai for their struggle against the suppression of children and young people and for the right of all children to education. Kailash dedicated the prize sum to the advancement of the rights of children and he gave his medal to the President of India, dedicating it to his motherland and its great people. 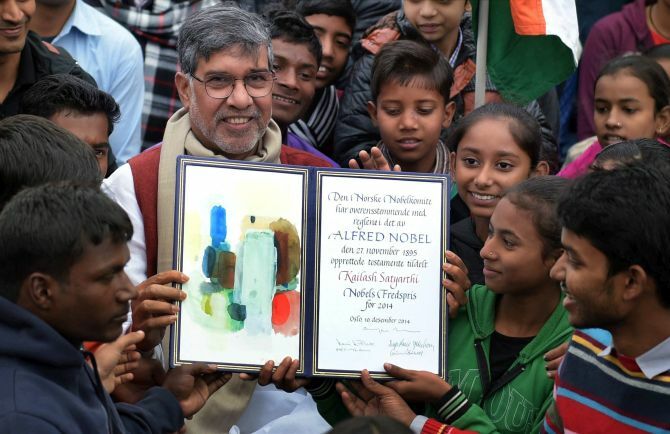 Two years later, Satyarthi founded Laureates and Leaders for Children, an initiative bringing together several Nobel Laureates and leaders from across the globe to build a sense of urgency, collective responsibility and a strong moral voice for ensuring the rights and safety of world’s children and young people. I refuse to accept that the shackles of slavery can ever be stronger than the quest for freedom. In 2015, he received international support when he succeeded in getting child protection and welfare-related clauses included in the Sustainable Development Goals of the United Nations. And in 2016, he launched the 100 Million for 100 Million Campaign, a global intervention to mobilize 100 million youth for shaping a better and promising future for 100 million not so privileged children.